Whenever I tell people I’m going to Amsterdam, their eyes light up and they give me a knowing grin. To many, Amsterdam is synonymous with “party.” Ambling through the city, you certainly get a taste of this: English-style pubs, hash bars and the (in)famous Red Light District. I’m in town with a rowdy group of American bartenders, but crowds like ours are so commonplace here that I hardly feel self-conscious. Amsterdam’s status as a prime center for both business and leisure travel is a legacy of the city’s golden age of trade and imperialism in the 17th century. Cultural exchange is a big part of its personality, and that extends to what people imbibe. Like the throngs of fashionable young hipsters riding their grandparents’ bikes next to modern streetcars along ancient canals, the local drinking culture is a mix of new and old that somehow manages to strike an unlikely harmony. Beyond the sometimes dominating tourist culture, Amsterdam’s drinks scene has distinct rhythms, traditions and preferences. Among these are a budding cocktail culture as well as genever—Amsterdam’s native spirit and the herby, malty precursor to gin. Genever seems a perfect symbol of Amsterdam. Like the city itself, it combines European traditions with influences from Asia and the Middle East. Genever is a dry spirit made from grains and distilled with herbs such as angelica, coriander, licorice and anise. Genever’s trademark is a marked maltiness combined with a complex but fairly light herbal profile. Like gin, genevers contain juniper, but generally in a much less prominent role. 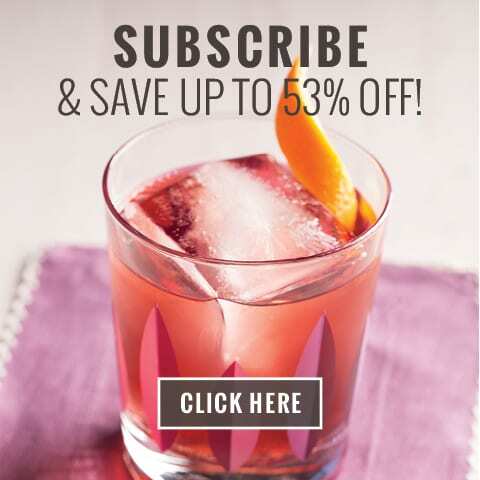 Distillers create their own unique formulas, which are often kept secret. Amsterdam pubs stock several types of genevers, the most common of which are jonge, oude, corenwijn and fruit. A general misconception is that oude and jonge genever means aged and unaged. In fact, the names refer to the recipes. Oude genever is an older formula, with a moderate amount of maltiness and botanicals. Younger generations of Dutch drinkers began desiring a smoother, mellower spirit, which led to jonge (young) genever, which is less malty and has a cleaner, more subtle taste, closer to a vodka. Corenwijn (also spelled corenwyn or korenwijn) is the maltiest. There are also fruit genevers—a more modern creation—which downplay the malt and botanicals and have added fruit flavors, such as berries and citrus. Genever can be aged or unaged. Maturing the spirit in oak barrels adds a complexity and round, woody flavors, similar to cognac or bourbon. Corenwijn, which goes through an extra distillation, is often aged for one to three years and is delicious sipped neat, while jonge and fruit genevers are commonly mixed with juice and soda or shaken in cocktails. Oude genever is enjoyed both ways. Like Champagne or Cognac, genever is governed by European Union laws of appellation of origin in order to preserve the spirit’s quality and authenticity. Only genever made in Holland, Belgium, and parts of Germany and France can legally bear the name. Oude genever is also produced in Argentina, where it’s extremely popular, associated with the gauchos who drink it out of a horn, but although this product is commonly called genever, it’s akin to calling California sparkling wine “champagne.” True genevers can be hard to find in the U.S., and those that are sold here are often labeled as gin and tweaked for the American palate. Among those found in the U.S. are Zuidam, Boomsma, Damrak and the new American-made Anchor Genevieve Dutch-style gin. While generally more mild and less full-bodied than traditional genevers, these spirits still tend to have more malt and less juniper flavor than other gins available on our shores. As a component of a classic martini, gin signifies old-school luxury. But the spirit hasn’t always had such a well-to-do reputation; indeed, its history is something of a saga. Genevers developed in Holland, first as a medicinal tonic focusing on juniper’s flavors and supposed health benefits, then incorporating the exotic herbs introduced by the Dutch trading bonanza. The spirit spread throughout the world thanks to traders, particularly to England, where the recipe changed to become drier and include more juniper, and the name was shortened to gin. The English, accustomed to the low alcohol levels of the beers they drank throughout the day, weren’t used to gin’s strength, and like teenagers raiding their parents’ liquor cabinet, they went a bit wild with it. In London there was a sort of gin epidemic, which became infamous and was even used by U.S. prohibitionists as evidence to further their cause. The good news is that barfolk had something new to play with. Since the new distilled form of alcohol was so strong-tasting, people experimented with ways to make it more palatable, leading to many cocktails now considered classics. When Jerry Thomas published his 1862 Bar-Tenders Guide, the gins that were widely available were closer to what we now know as genever, so most of his “gin” recipes (save those that called specifically for Old Tom) were originally developed for genever, according to spirits historian David Wondrich. 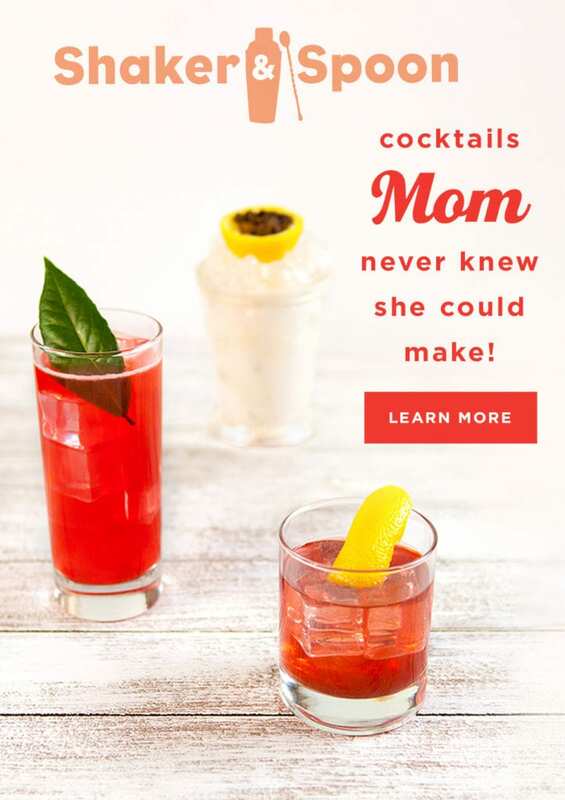 Nonetheless, this cocktail culture that developed in England and the U.S. didn’t really catch on in Holland, where genever has traditionally been enjoyed straight or in simple combinations. People often enjoy a kopstoot, or headbutt: a shot of genever sipped alongside a beer. Some prefer to mix jonge genever with juice or soda. The Dutch often drink genever in bruine or brown pubs, Holland’s equivalent of a neighborhood bar. Brown pubs, so named because their walls and ceilings are stained brown with decades of built-up cigarette smoke, are where locals head for a casual drink among friends. Café Wildschut is a typical example, located in a beautiful but aging art nouveau building. The atmosphere is casual, although slightly upscale due to the bar’s location in the museum district. The menu consists of typical Dutch fare, such as starchy croquettes, as well as excellent chicken satay. There are high numbers of Indonesian immigrants in Amsterdam, and the city’s diners benefit from their culinary influence. Along the same lines of the brown pub but more specialized are Amsterdam’s proeflokaals, or tasting rooms. On the ground floor of one of the 300-year-old houses just off the Dam Square is De Drie Fleschjes, or the three little bottles. Proeflokaals are typically devoted to a particular kind of drink, and this one specializes in genevers and liqueurs. Behind the bar are shelves lined with old stoneware liqueur jugs with painted labels, and below them, a colorful row of shiny, modern liqueur bottles. The opposite wall is lined with wooden barrels turned on their side, each with a spigot and a name emblazoned on the end. These are company casks: Businesses rent their own barrel and have it filled with whatever they choose: high-quality corenwijn for entertaining clients, or cheaper spirits, perhaps to dissuade employees from three-kopstoot lunches. In the back, four middle-aged Dutchmen engage in heated conversation over genever and beer. Here, I learn the proper genever drinking custom: the bartender fills a tulip-shaped cordial glass nearly to overflowing with ice-cold genever and places it on the bar. Without using hands, I bend down to the glass and slurp off the top. This lends a certain levity to the experience; it’s hard to take oneself too seriously when drinking noisily from a tiny glass. De Drie Fleschjes also serves cocktails, but not the fruity, brightly hued showpieces being shaken up at many of Amsterdam’s slick, modern bars. In the same glasses used for shots of genever, the bartender mixes simple concoctions like the house specialty, Boswandeling, or A Walk in the Forest: jonge genever, triple sec and a generous bloom of Angostura bitters. 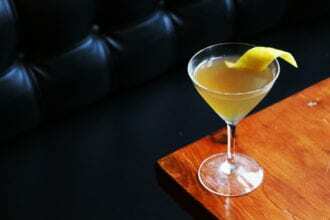 The drink is sweet and strong, with the unmistakable herbal taste of genever. Across Amsterdam is a growing cocktail culture built on dressed-up cocktails, a slick aesthetic and a hefty dose of flair. Some of the modern bars incorporate genever into creative cocktails; others instead focus on myriad other spirits, such as tequila, rum and vodka. Feijoa, a modern bar serving many sweet concoctions but also well-versed in the classics, is a good barometer for the direction of Amsterdam’s cocktail culture. Like many of the city’s bars, Feijoa, located between the Flower Market and Rembrandtplein, is housed in a renovated old building made over with slick chrome and glass, bright red and yellow lights, a powerful sound system and plenty of mirrors. But although it is thoroughly chic and urban, the vibe is a lot closer to a neighborhood pub. 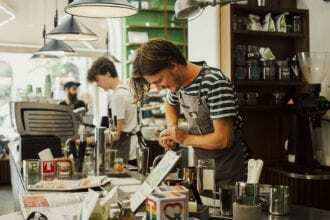 Timo Janse, a national champion competitive bartender who tends bars here, prefers to talk to customers about their preferences before shaking them a drink. In the mood for fruit? He might make you a Strawberry ‘n Balsamic Tin, with just enough vinegar to play up the berries’ flavor. Brambles, made with gin or genever, blackberry liqueur, lemon juice and simple syrup, are also popular. Everybody seems to know one another at Feijoa. “It’s like your second home, but with a butler,” says Renee de Vries, Janse’s girlfriend. When I return a few days later and ask if the bar has been busy, Janse smiles. “It’s cocktail night,” he says. “Saturday night, all the Dutch drink cocktails.” Indeed, the bar is hopping all night. After Feijoa closes for the night at 3 a.m., it turns into a private party and the merriment continues, until it’s 4 in the morning and Feijoa’s owner, Sergej Fokke, is pouring genever into the mouths of his friends from the bar’s mezzanine. Herrie, an upscale cocktail lounge on Utrechtsestraat downstairs from a restaurant of the same name, is slightly more restrained, but just as popular. At happy hour the basement-level bar is packed, but the crowd is somewhat older and more subdued than some of the city’s other clubs. Here I watch Kristiaan Jagerman, a black-clad bartender who infuses his style with a subtle flair—a flick of the wrist here, a toss of a glass there. His drinks are among the tastiest in town. The bar’s Sazerac substitutes bourbon for the traditional rye, which gives it an extra little sweetness that seems perfectly Dutch. While sweet and fruity have long been de rigeur, Sporkslede notes that as in the U.S. and London, classic cocktails are beginning to take hold. 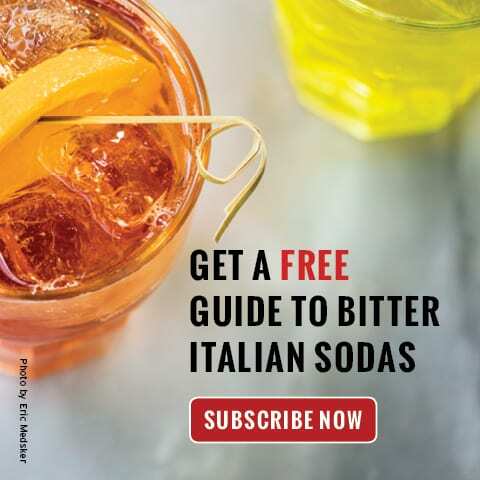 “Current trend is undoubtedly leaning more towards Prohibition-style drinks, which require skill to make and a sophisticated palate to balance,” he says. 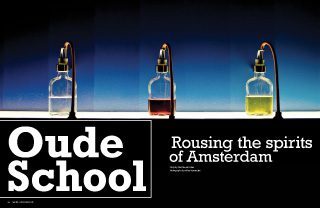 Amsterdam’s drinking culture can’t be pinned down to just one style or another. Like any good party, there’s a lot going on, and a diverse guest list. From old-school distillers and proeflokaals to newfangled bars, there is plenty of history to draw from, and plenty of creativity to take it to the next level. As both sophisticated bartending and interest in classic cocktails grow, there’s no doubt that Amsterdam will continue to be a global center for sipping. 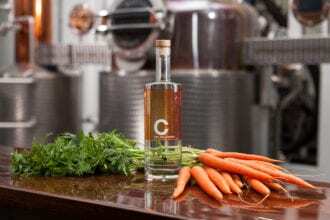 The new spring release from Boardroom Spirits gets creative with carrots.